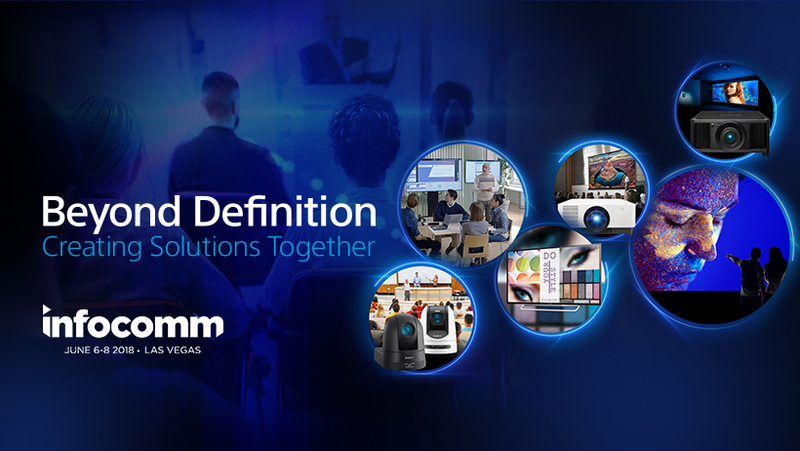 At InfoComm 2018, Sony is “Creating Solutions Together” with its partners and customers, highlighting a full line of professional display, A/V and presentation technologies. Visitors to the Sony booth, C2363 will see the immersive 8K x 4K Crystal LED Display System, Sony’s highest brightness laser light source installation projection, pan-tilt-zoom (PTZ) cameras, BRAVIA Professional Displays and more. The professional display and A/V production markets are rapidly changing, and Sony’s solutions and new products featured at the show are designed to meet a range of applications, requirements and budgets. Visitors to the Sony exhibit can experience the latest technologies through interactive and simulated “real-world” scenarios that illustrate the practical benefits and applications of Sony’s solutions. Various demonstrations and scheduled seminars will take place to introduce a range of new products and solutions. Anchoring the booth will be Sony’s scalable 8K x 4K Crystal LED Display System in an impressive 32-foot x 18-foot configuration consisting of 288 units, which is sure to gather a crowd. Attendees will be able to view spectacular footage such as corporate, automotive, e-sports, entertainment and retail, on the industry’s first end-to-end 8K 120p HDR display solution, shot by UHC-8300, Sony’s first 8K System Camera. With a contrast ratio of over 1,000,000:1 and a 99% black surface area, Sony’s Crystal LED offers high contrast, high resolution and immersive visuals. The latest version 1.1 of Sony’s flagship interactive collaboration and active learning solution ‘Vision Exchange’ will also be on display for the first time and demonstrated on the show floor. The upgrade allows for improved communication through the integration of Skype for Business, which enables distance learning, as well as Personal Note Taker, for smarter note-taking. Version 1.1 is applicable with the main units PEQ-C100, PEQ-C130 and the Pod PC Software PES-C10. It is planned to be released in June 2018. Customers who previously purchased V1.0 can upgrade to V1.1 at no additional cost during the first year of purchase. For future updates, Sony’s Software Upgrade Program (SUP) will provide users with an annual subscription to ensure their version always remains up to date with the latest functionality. At InfoComm, Sony’s new high brightness installation laser projector, VPL-FHZ120L (WUXGA 12000lm) and VPL-FHZ90L (WUXGA 9000lm) will be showcased and in use for the first time in the U.S. Both models offer visibly superior pictures ensuring audience engagement and a minimalistic design to blend-in in various environments. They also come with the advantages of a laser light source, including increased brightness, ease of use and installation flexibility. The VPL-FHZ120L is ideal for auditoriums and conference halls supporting live performances and ceremonies. The 3LCD installation projector covers sRGB100% and is suitable for applications requiring precise color reproduction such as in exhibitions and museums. The VPL-FHZ90L is suitable for mid to large-sized classrooms or corporate meeting rooms, even those with challenging installation demands including natural lighting or bright spaces. Demos on-site will showcase the VPL-FHZ120L’s its industry-leading wide lens shift capabilities (Max. Vertical ±107%, Horizontal ±60%). VPL-FHZ120L is planned to be available in August 2018 and VPL-FHZ90L is planned to be available in September. Sony’s full lineup of PTZ cameras, including BRC-X1000/1 (4K) and BRC-H800/1 (HD) models, will be on display at InfoComm, combining image quality, sensitivity and flexible remote operation for broadcast and production. New to the show, BRC-X1000/1 and BRC-H800/1 will be available in white, ideal for environments such as classrooms, churches, government buildings, medical spaces and corporations. The models are planned to be available in August 2018. In the booth, BRC-X1000/1 will be showcased in the lecture capture area. Visitors can see the examples of different use cases such as event shooting, distance learning, corporate training and high-end video conferencing with the SRG and BRC PTZ cameras. Sony’s newest BRAVIA Professional Displays in 43”, 49”, 55”, 65”, 75” and 85” models are enabling collaboration in education and corporate applications including meeting rooms, classrooms, lobbies, hotel guest rooms, showrooms, sports venues and more. Highlights include scalable architecture, operation on the Android TV platform, an intuitive user interface for content, device management, network and serial communication control, flexible installation options and HTML5 support. It can even be used in conjunction with Vision Exchange to create a fully functional huddle room or collaborative learning environment. The new displays are planned to be available in June 2018. Experience Sonic Surf VR, a unique suite of spatial audio technology combined with new multi-channel speakers and specially developed software designed to simulate placing, moving, and partitioning sounds in one space using an intuitive software application. The result is an interactive area where sounds move freely around within a space to create immersive experiences. At InfoComm, Sonic Surf VR will allow attendees to visit not only a virtual aquarium but also a virtual museum, offering sound partitioned audio in multiple languages. Sonic Surf VR is suitable for wide range of applications, such as location-based entertainment like theme parks, special events, exhibitions, museums, aquariums and corporate showrooms. As a stand-alone audio experience or combined with digital signage, projection mapping and lighting, creators and producers who are producing dynamic content with innovative design elements can further enhance the value of their work with Sonic Surf VR. Sony also encourages students studying content design to experience and leverage this new technology for their creative ideas. Sonic Surf VR is planned to be available in June 2018. Two additional solutions under development will be on display to maximize and enhance Sony’s Crystal LED display system and address requests from customers. Beyond 4K AV over IP for Crystal LED is an IP-based workflow for content sharing and design review. At the booth, visitors can experience the simple and flexible sharing and monitoring of large volumes of data, with fewer cables and more reliability. It is also planned to have the capabilities to monitor the flow and status of packets as well as past logs using Sony’s original Software Defined Network (SDN). In addition, Sony’s Color Management Solution is designed for situations where extreme accuracy and precise color matching among displays are required. The Crystal LED display system can be used to seamlessly match with Sony’s 4K OLED master monitor BVM-X300 and LCD monitors for easy adjustments and consistent color uniformity, often necessary in design simulation and retail. For more information, see Sony at InfoComm 2018 June 6-8, Booth C2363, or visit www.sony.com/infocomm.